Off-road driving can be great for both seasoned professionals and amateurs who want to try something new and exciting. Driving on off-road terrain takes experience and training in the techniques of surmounting the obstacles common on that type of territory or found on the artificial tracks such as steep slopes, twists, and V-ditches. Thanks to the growing number of manmade training tracks, off-road driving is becoming an increasingly popular form of recreation and escape from everyday stress. Off-road terrain can differ in type and configuration, ranging from earth, sand, rock, to asphalt, etc., offering drivers possibilities to test both their driving and mental skills. Driving on this type of terrain has its advantages and drawbacks but the aim is always the same – to pass all the obstacles as quickly as possible without getting stuck and left behind. Driving terrains leading through rural or mountain regions will bring the driver closer to the natural beauty of those areas, and also give him a chance to learn about their culture and history. Regardless whether you have set off on the off-road adventure on your own or as part of a group, you will have to be aware of the techniques for overcoming obstacles and mastering the territory, not to mention the ability to know when to admit defeat, because even the most experienced of drivers may find themselves in a fix. The Dakar Rally is the best-known off-road rally, regularly run since its inception on 28th December 1978. In 2015, the Dakar will take place in Argentina, Bolivia and Chile. To take part in off-road driving you have to become aware of your abilities, learn ways of overcoming obstacles, and be familiar with your vehicle and the tracks in the off-road “schools” are the perfect place for that. 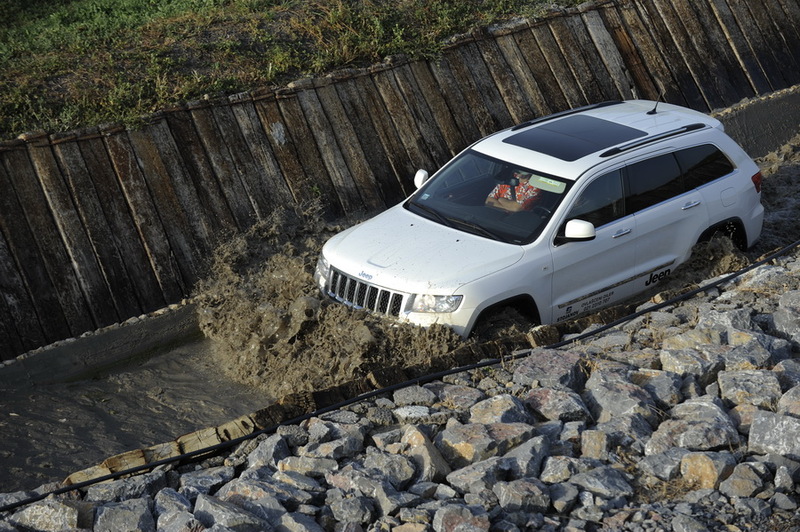 The most popular track for off-road driving in Serbia is that of the National Driving Academy – NAVAK, and in Slovenia, the Španik vadba varne vožnje track. For the less experienced in off-road driving, beginner terrain training can be organized, where drivers will be accompanied by instructors as they learn about overcoming basic fixed obstacles which represent the essence of terrain driving and become familiar with their vehicle’s performance. After the initial training, there is the asphalt-terrain training where candidates are introduced to driving at high speed and basic rules of safety. After the training on asphalt, drivers proceed to the terrain track which is usually a combination of earth, rock, obstacles and trees, and includes forest trails. A growing number of companies are interested in organizing team building activities for their employees with the aim of encouraging a good working environment and testing their abilities. The activities selected for the team building can vary and one of the less ordinary ones is off-road driving. Team work is essential on trips such as these. What happens when you get stuck in mud? Will you work together as a team to pull out or will you blame the driver? These situations show who is the natural leader, who is willing to risk for the team, who the most resourceful members of a group are but they also throw a light on the diffident and passive part of the crew. Off-road team building activities can take anything from a single day to several days. The program is defined depending on the group and the wishes of the company, and it includes terrain vehicles, instructors, hotel accommodation and transfer to the distant location removed from the hustle and bustle of the city. Although staying in a hotel has its distinct advantages, camping close to the off-road terrain can also be interesting. The participants can have fun making camp fires and enjoying the natural surroundings. In addition to the close contact with nature, they will also be able to get to know about the history of the location. Whether you are part of a team or come on your own, off-road driving will be an adventure that is sure to give you an adrenalin rush and make you want to come back for more. Random Acts of Kindness – Be the Change You Wish to the World!